The first time I had this dish (炒土豆丝 * Chǎo tǔdòu sī *) was at my paternal aunt’s house in the countryside of northern Jiangsu province way back in 1999. I was studying abroad in Beijing at that time and tracked down my father's side of the family through an old address that my mother found in my late father's address book. My Chinese roommate helped me call the mínzhèngjú (municipal government bureau) and after going through the runaround of being told "oh dial this number next to ask this person" at least 20 times, we were finally able to get their neighbour's phone number. I visited them during my fall (autumn) break and let me tell you... just getting there was an experience in itself for this teenager from rural North Carolina. They lived in a traditional courtyard style house where the kitchen was in a small room adjacent to the entrance of the courtyard. They cooked on a massive wok that was heated over strips of wood and straw. When I walked in I could barely breathe through the thick smoke and kept coughing. My cousin's wife quickly ushered me out. Anyways, I really loved the simplicity of the dish and the texture of the potato shreds. It was like a Chinese hash brown. I tried to replicate the dish back when I returned to North Carolina and had no idea what I was doing. It was later that I learned that the secret is to shred the potatoes at certain size (not too thin like using a shredder, but also not too large and bulky like a British chip) and marinate it in vinegar water to tenderise the potato. It's a sī dish like ròusī, which means the food is shredded for quick stir frying, probably to make use of high levels of heat in short durations so as to preserve the heating fuel (in this case, strips of wood and straw). Meat can be added to this dish to add more flavour, however, in this recipe I've stuck with the vegetarian version. 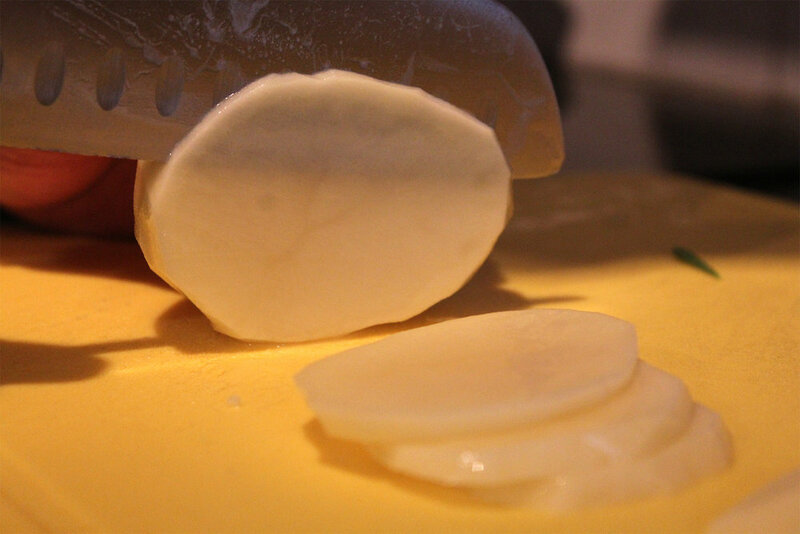 To slice the potato strips, first slice the potato horizontally, then line up the slices and slice into thin shreds about 3mm by 3mm. Drop strips into a bowl of water with 3 tablespoons of vinegar to marinate. Do this immediately otherwise, the potato shreds will brown in a really weird discoloured way. Marinate this for 20 minutes. Slice celery and green peppers into thin strips. 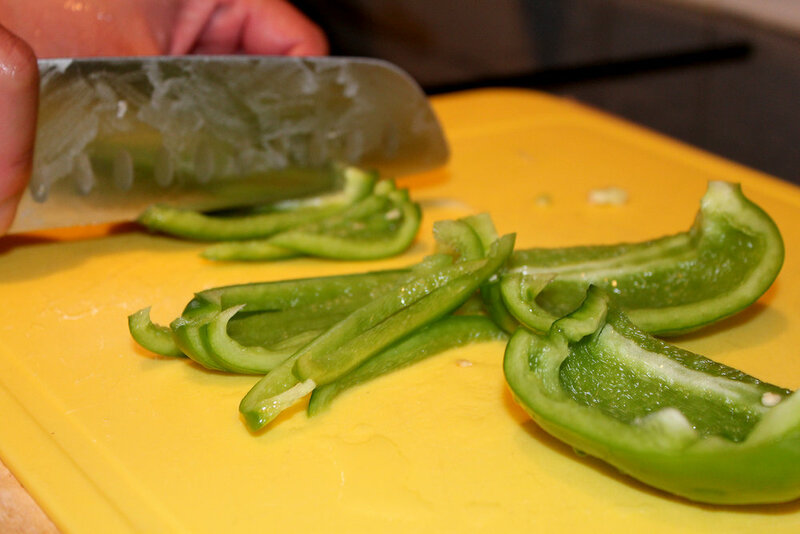 For the green peppers remove the seeds and inner white sections before slicing. Boil water in a pot with 2 tablespoons of vinegar. Blanche potato strips in boiling water for 1 minute. Drain thoroughly. Heat oil in a wok to medium high and fry the Sichuan Pepper corns for 2 minutes and remove the pepper corns. Retain the seasoned oil in the wok. Fry the diced garlic and ginger for 30 seconds. Add the potato strips and stir fry on high heat for 3 minutes. Make sure the potato threads do not over cook or the texture will get elastic and soggy. Add the peppers and celery and stir fry for an additional minute. Add 1 teaspoon of chilli oil (optional). Make sure the the peppers aren’t over cooked. Add a teaspoon of salt, stir fry for an additional 30 seconds and remove. Douse with coriander and voila! It makes a good side dish to a meat or seafood dish. Red or white wine? It doesn't matter. Tip: It's best to add salt to a vegetable dish towards the end of the cooking process otherwise the salt will drain too much water out of the vegetables causing the dish to become soggy. Slice potato strips. First slice horizontally, then line up the slices and slice into thin shreds. Drop strips into a bowl of water with 3 tablespoons of vinegar to marinate. Slice celery and peppers into thin strips. Blanche potato strips in boiling water (with 2 tablespoons of vinegar) for 1 minute. Drain thoroughly. Heat oil in a wok to medium high and fry the Sichuan Pepper corns for 2 minutes and remove the pepper corns, but retain the seasoned oil in the wok. Add the green peppers and celery and stir fry for an additional minute. Add 1 teaspoon of chilli oil (option). Makes sure the the peppers aren’t over cooked. Add a teaspoon of salt, stir fry for an additional 30 seconds and remove. Top with chopped coriander (cilantro).